The watermelon is oddly convincing as the nori seaweed flakes hint of brine, yet the sweet watery crunch mingling with sesame oil gives you reassurance that it's watermelon after all. Add radish, cucumbers and avocado on top of sushi rice and it's a simple summer dish to enjoy out on your patio. This recipe is one of the many I've tried by Purple Carrot, a plant-based meal delivery plan. Out of curiosity and also necessity -- I'm a busy mom of three kids and maintain my day job as well as two blogs and other entrepreneurial endeavors -- I thought I'd give a meal plan a try out. You might imagine that as a food blogger I have dinner covered, at the very least. But that has not been the case! My honest and unbiased opinion (as this is not a sponsored post) is that Purple Carrot is a great help when I have no idea what I'm going to make for everyone. Believe me, when I'm slacking on the meal planning and too busy to have a proper meal during the day, I get way hangry. It's a relief to have the Purple Carrot box on my doorstep and totally saves me time on grocery shopping for creating sit down menus for a family weeknight dinner. Also, it's fun for someone like me that already has a sense of recipe creating, as it gives me new ideas and expands my repertoire. This watermelon poke bowl is a keeper on the recipe list! Directions: Cook rice. Dash of rice vinegar & mix into rice. Allow to cool (can place in fridge). Prep veggies (slice radishes, cucumbers, avocado, dice watermelon into bite size cubes). Make dressing (mix sesame oil, tamari, rice vinegar & seaweed flakes). 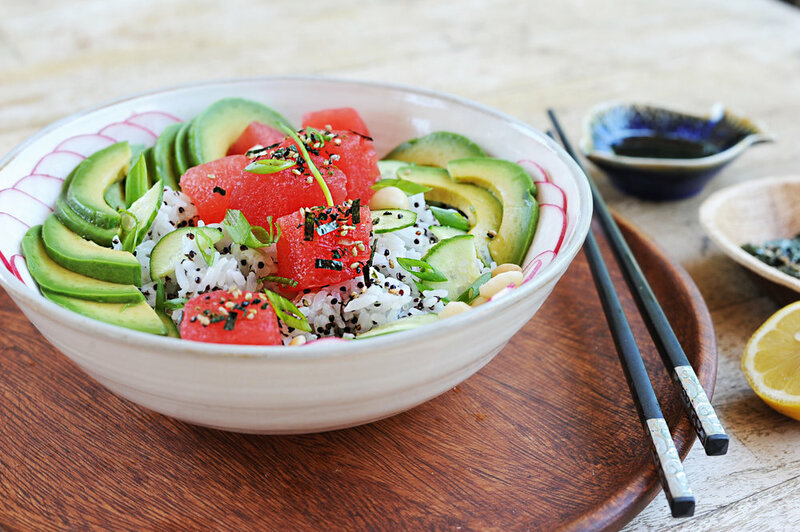 Scoop sushi rice into serving bowls, top with watermelon, radish, avocado, cucumber, macadamia nuts, and drizzle on the dressing. Garnish with sliced scallions (optional if you have them) and/or cilantro. .